“COME UP AND GET ME!” The first words heard from the toxic and generally unclassifiable duo (electronic-crash-boom-bang-art-noise-rage-rap) Death Grips, that being daft drummer Zach Hill and diabolical vocalist Stefan Burnett. The two nonchalantly weaved through the crowd, clothed in black from head to toe, and began to set up the stage themselves. Two monitors, a laptop, a three-piece drum set and a microphone. After assuming their performance attire (and by that, I mean shirts off and the meanest mugs you ever did see), the duo stood silent, impatiently waiting for the sound engineer to cut the music and let them begin their set. MC Ride screamed, “CHECK!” The music shuts off immediately, and the first electronic buzz of ‘Come Up and Get Me’ sneak into the air. From now on, all hell is welcome to break loose. Death Grips were on tour promoting – well, somewhat – their latest effort No Love Deep Web, which they released without their label Epic’s knowledge and has quite the memorable cover art. It somehow manages to be more aggressive, mentally possessive, chaotic and disturbing than earlier works Ex Military and The Money Store combined. They brought this new collective of chaos to Wrongbar on Sunday night, feeding a crowd that surged towards the stage as the auditory madness swirled about. Burnett and Hill were men of no words, banging through track after track with scarce pause in between. The songs melted into one another, a bubbling mess of Hill’s primitive and animalistic drumming, backed by Andy ‘Flatlander’ Morin-produced beats (he was MIA, for reasons unknown) and heralded by the passionately possessed Burnett. The two onstage are quite a sight to behold; Burnett flails his arms in almost unprecedented, joint-less ways, pausing now and again to shiver and violently shake to the beat. The two seem consumed by their sound, completely in their element. It is intense, sheer doom, an auditory attack. The crowd, most of whom assumedly were pained by the cancellation of their scheduled NXNE set, were simply mesmerized by the two, feeding off their energy and reacting heavily. Tracks like “Guillotine,” “I’ve Seen Footage” and “Takyon” broke it off, while “Get Got” and “The Fever (Aye Aye)” saw Burnett commanding the crowd to move in an almost villainous manner. Link Wray-sampler “Spread Eagle Cross The Block” was thrown into the mix, that being a rare taste of their first EP Ex Military during this set made up primarily of their newest work. Hill banged away tribally, Burnett spewed and screamed and skewed his vocals throughout the barely hour-long experience. Just as quick as they began, the two reassumed their outer attire, and snuck their way through the crowd. No words spoken, but none really necessary. This is a duo that doesn’t give a damn, quite frankly. They came, they conquered, and left everyone completely bonkered. That being said, there was a slight feeling of dissatisfaction that couldn’t be shaken. 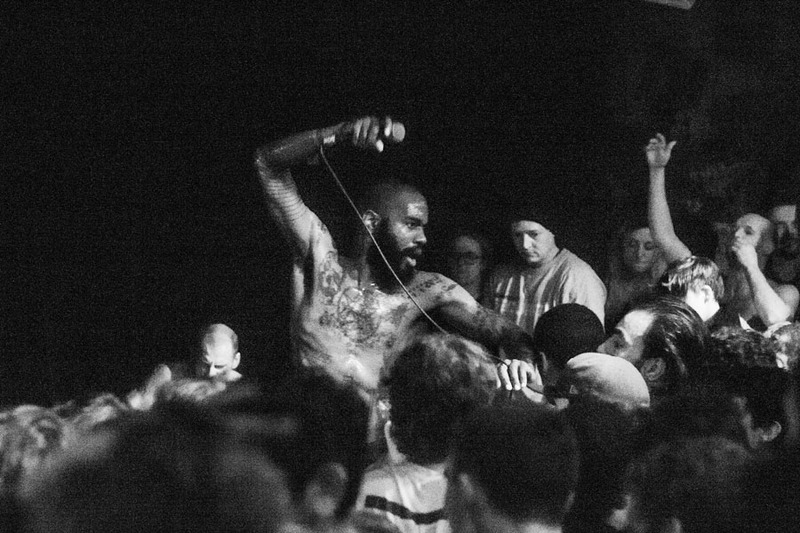 Perhaps it was realizing that MC Ride is not, in fact, some embodiment of a satanic being, but a man that was beginning to show signs of vocal strain. Perhaps it was the strong disconnect that was felt during the set; perhaps it was the length of the set. There still can be no denying that seeing Death Grips live is worthwhile and wild. Give it a go – if they keep on keeping on, that is.